The first in a new series looking at retailer’s stories. You’ve earned customer loyalty when they camp out in below freezing temperatures for two days just to be the first to shop at your new store. Greensboro residents Jordan Morris and James Rudder huddled together in a tent Wednesday night to ensure they’ll be the first customers at Acme Comics Presents, the latest venture by North Carolina comic book retailing juggernaut Acme Comics. 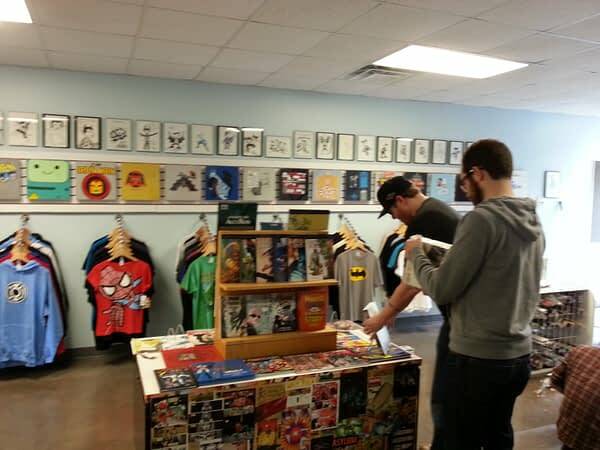 Unlike its big brother store, Acme Comics Presents will have a limited stock of comic books and graphic novels when it opens Friday. Instead, shop creators Jermaine Exum and Stephen Mayer are focusing on geek culture by offering clothing, original art prints, creative how-to items and specialty items like guitars featuring some of comics’ best loved heroes. It could be the future of comic stores as digital expands. ACP I – L-R – James Rudder and Jordan Morris stand with Acme Comics Presents manager Stephen Mayer in front of the new store. Rudder and Morris camped in front of the store for two days to be the first customers. ACP II L-R – Jordan Morris and James Rudder camped in freezing weather to be the first customers to shop at Acme Comics Presents.